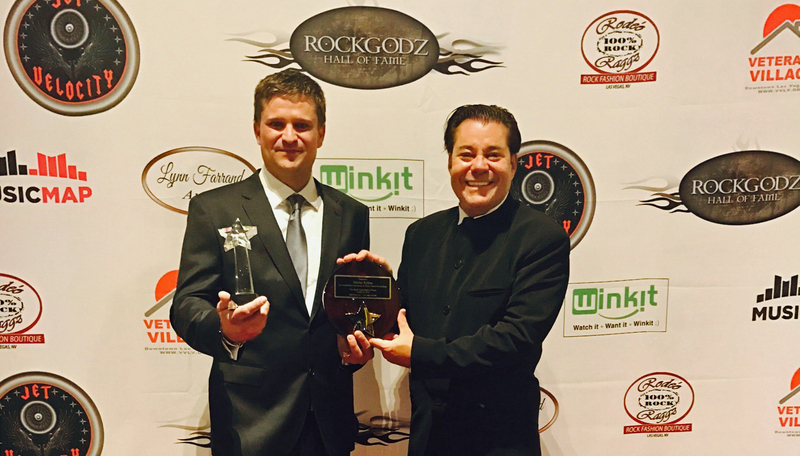 Czech Republic producer Marko Rybka, collected the first-ever RockGodz Hall of Fame induction for an Eastern European music industry professional, on October 27, 2016 at Hard Rock Live in Las Vegas. The prestigious award was presented by fellow inductee, Al Bowman, who was also inducted that evening for his 25-year history of producing the Los Angeles Music Awards in Hollywood, California. The RockGodz Hall of Fame was founded by seasoned entrepreneur Cindy Landeen and legendary rock journalist Steven Rosen. The awards show was produced by RockGodz director of A&R and Producer Jason Ebs, and hosted by Las Vegas famed Steve Hart. Other RockGodz Hall of Fame inductees included; Michael Anthony (Van Halen), Dave Amato (REO Speedwagon), Hugh McDonald (Bon Jovi), Kevin “Dugie” Dugan (Bass Tech Extraordinaire for Van Halen), Buster Akrey (The Power Rangers), Freddie Salem (The Outlaws), Jeff Young (Megadeth), Scot Coogan (Ace Frehley), Al Bowman (Executive Producer, LA Music Awards), Sandy Rizzo (Artist Manager; KISS) and Lonn Friend (Rock Journalist: Editor RIP Magazine). The event was sponsored by Sin City Presents, Veteran Village, Hard Rock Live, Jet Velocity and MusicMap.TV.